Today is the first day of spring. It’s also the vernal equinox in the northern hemisphere, which means that the days will be longer than the nights and continue getting longer from now until the summer solstice. The official changing of the seasons is all over my social media, but given that I live in Canada, it seems rather… Optimistic. My pallet trellis in my back garden. I totally understand how everyone wants it to be spring; this March went in like a lamb, and was preceded by record-breaking high temperatures in February. It looks like it will go out like a lion, with snow predicted again at the end of this week and the start of next week. For people who aren’t used to this climate, winter seems never-ending. But for those of us who grew up with it, we can see the little hints of spring: the days are regularly are above freezing in the afternoon; snow has melted back from the roads and sunniest areas of yards; snowbanks have compacted so that they’re no longer higher than my head; and we’re starting to actually have humidity in the air again. It’s at times like this that I really feel for my European (mostly British) ancestors. I recently watched the Historical Farm series from the BBC. What struck home the most about the show was how green things remain in winter; in fact, the show often speaks of winter crops or winter harvests. Nothing grows here in the winter. 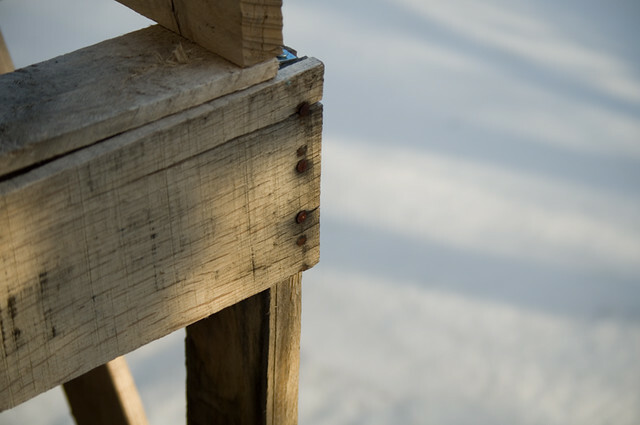 To a great degree, everything stops when it starts to dip below freezing. I mean, we do still go outside, and our most famous sport, hockey, pretty much requires this kind of weather. But special care must be taken, and a huge part of our lives simply moves indoors. As for the animals, birds fly south, and many creatures hibernate or semi-hibernate. Outside of hunting and fishing, there’s not much you can do to gather food in the winter, which is why preserving is so historically important. (There’s a great food preservation exhibit at the Canadian Agriculture and Food Museum.) Effective food preservation could literally be the difference between life and death. These days, with commercial transport of food from all over the world, we can get fresh food almost as easily in winter as in summer, although supplies can become short in the event of a big snowstorm. Also, some things remain purely seasonal — and at the end of the winter, even the imported food is of lesser quality. This mixture is also great as seasoning for bread stuffing. 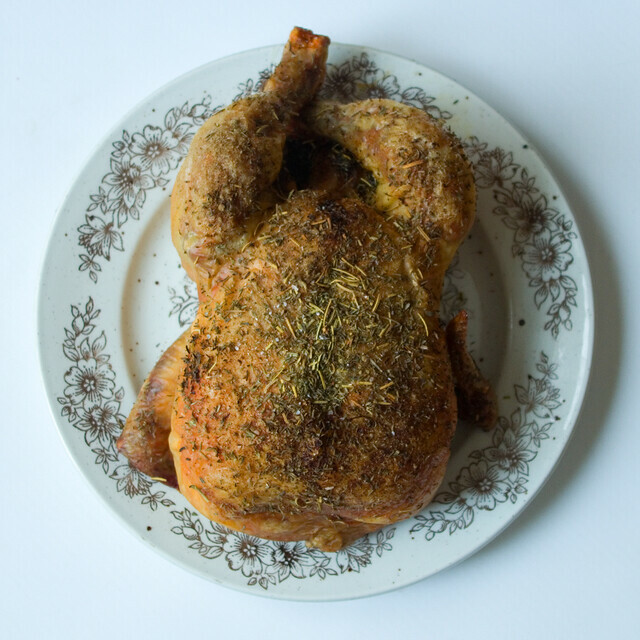 The chicken is baked in the oven at 350°F (177°C) for 20 minutes per pound, plus 15 minutes. Keeping the skin on means that it doesn’t have to be basted. The chicken is done when it pulls apart with a fork and has no pink spots. 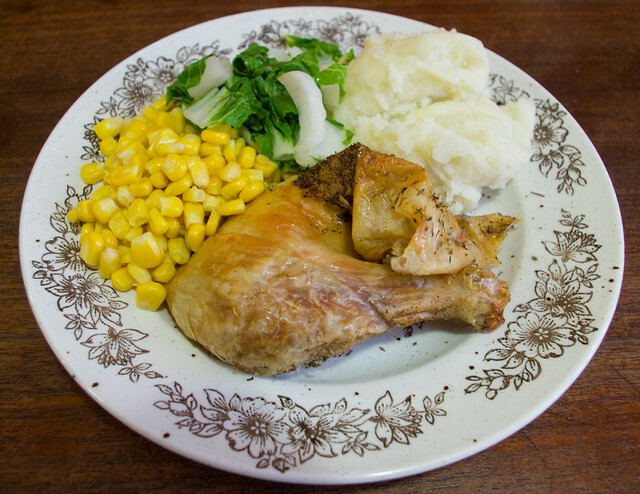 Baked chicken with chicken skin, mashed potatoes, corn, and baby bok choy. I generally serve this style of chicken with mashed potatoes and steamed vegetables. Since no part of the meal requires close supervision at all times, it’s the perfect thing for when I have to cook dinner and do something else at the same time, such as help the kids with their homework or supervise bath time. Posted on March 21, 2017 March 20, 2017 by owntwohandsblogPosted in CookingTagged easy, food, main course.